Here’s a close up | I made a little resolution list of things for myself to try to do in December: Travel & Explore | Finish reading a murder mystery book (I’ll have to blog about it some time, its fun!) | Photograph more | Do a little exercise | Get Organized. I also used the stars cluster and stamped it in several areas on this calendar. This kit is a collaboration with the fun and fabulous KELLY PURKEY! It’s such a great kit for starting the new year off right! 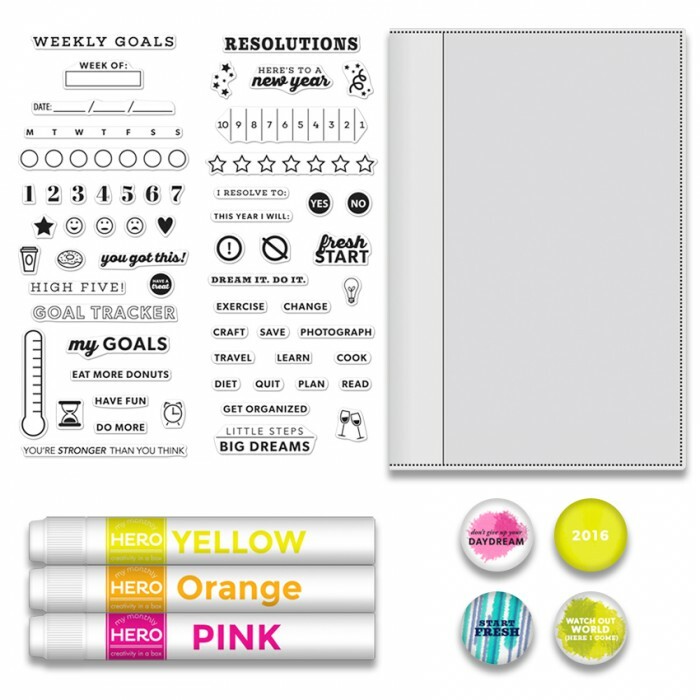 The full kit will contain – two 2.5×6″ stamp sets, 3 mini neon ink daubers in pink, yellow & orange, 4 badges designed by Kelly, all packaged in Kelly’s 4×6 wallet insert. Kit retails for $29.99. There is also an add-on 3×3 stamp set to purchase separately for $5.99. The kit goes live in the Hero Arts store on Monday Dec 7 at NOON eastern. The kit is available for a limited time only – once it’s gone, it’s gone. Love it, Yana!! Love how your added your own writing to some of the little words, that’s a cool combo. Nice planner. Thanks so much for sharing! Makes my old way of day planning look drab compared to the wonderful look of this. What a fabulous kit and I loved seeing how you used it in your planner. Thanks so much for the peek at your creative process. I wanted to make a goal tracker for some time now… It would be so easy with this kit! to use in a planner! Love how you added in handwritten words with the stamped text! I am excited to see all of the elements of this kit in use. Looking forward to starting the new year with new products and ideas. Love the little stars on your pages. This looks like a really good kit for planning. Cute planner! I feel like I should jump on this band wagon! My planner is boring! Love the stars. I didn’t notice them at first! Super cute kit, love the colors! This looks like a very useful kit! Love all the new stamps and the great methods to organize life! Awesome use of the stamp with a bit of your own writing! 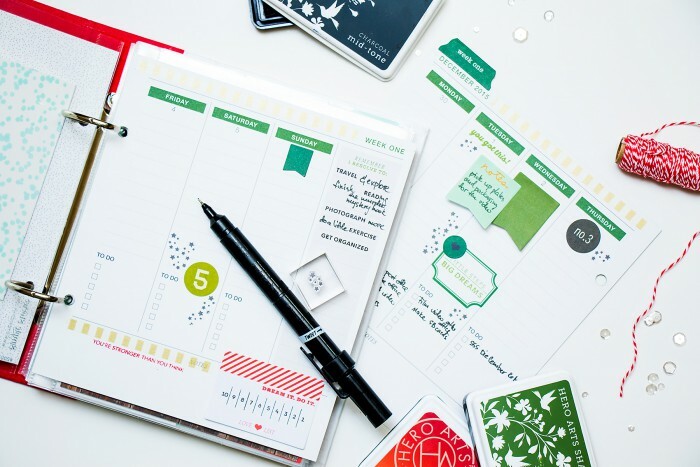 Great planner, and you have done a great job, such a useful set. Oooooh I love this kit and I love how you used it. Your planner is fabulous! Very creative way of using this MMH kit! 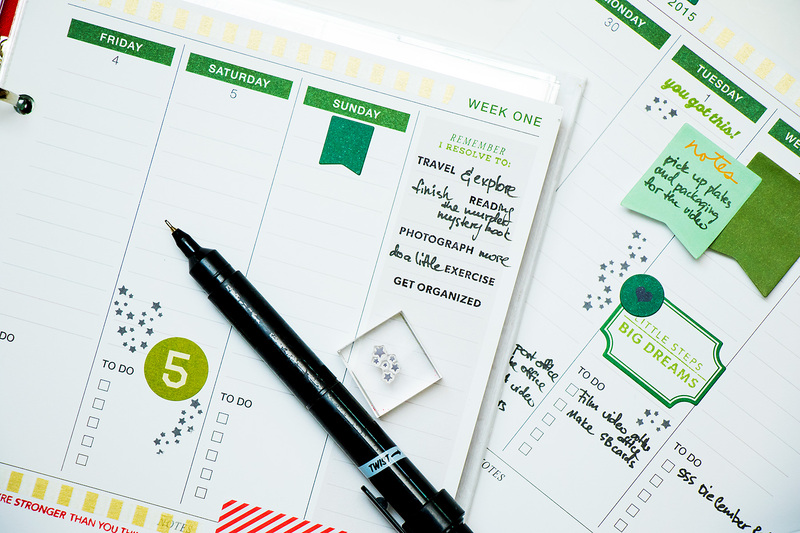 Thanks for sharing your planner inspiration with all of us. Love your idea…. Thank you for the inspiration. Cute calendar page, love the stars! Thanks for sharing. Thanks for sharing!! Gives me some super ideas for my planner!! My planner is going to look so good. I like how you highlighted that the stamps will fit nicely into smaller planners, too. I like Kelly’s wallet planner, but one could also use all of the stamps on many other albums or notebooks! TY 4 the inspiration! Oh I like seeing ways to use the products in this kit. Well done! I love how you used the kit – very cool!